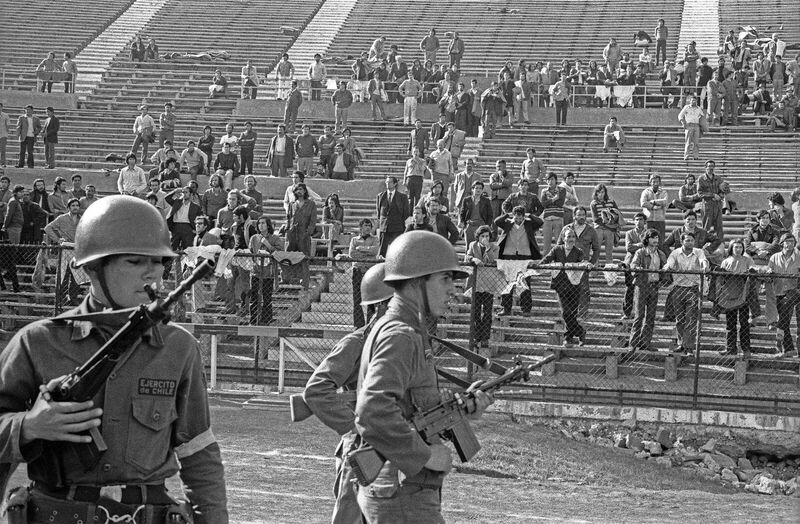 Chile’s National Stadium was for a day a building and a city. On the 29th of September 1979, the building was filled by 37,000 people for a massive operative which provided ownership titles to dwellers (pobladores) fixing decades of makeshift land occupation and policies. 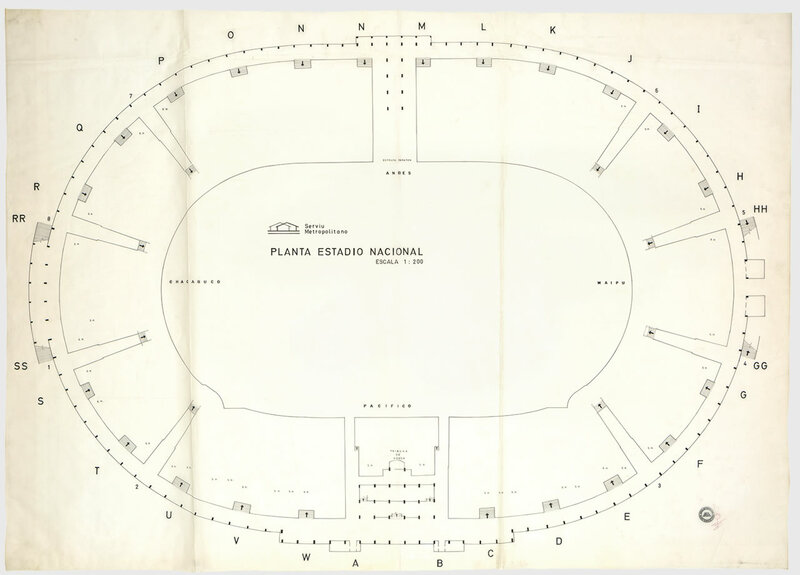 A blueprint of the stadium with the outline of shantytowns instead of bleachers was prepared, rendering the genesis of Santiago´s current layout within the drawing of a building. 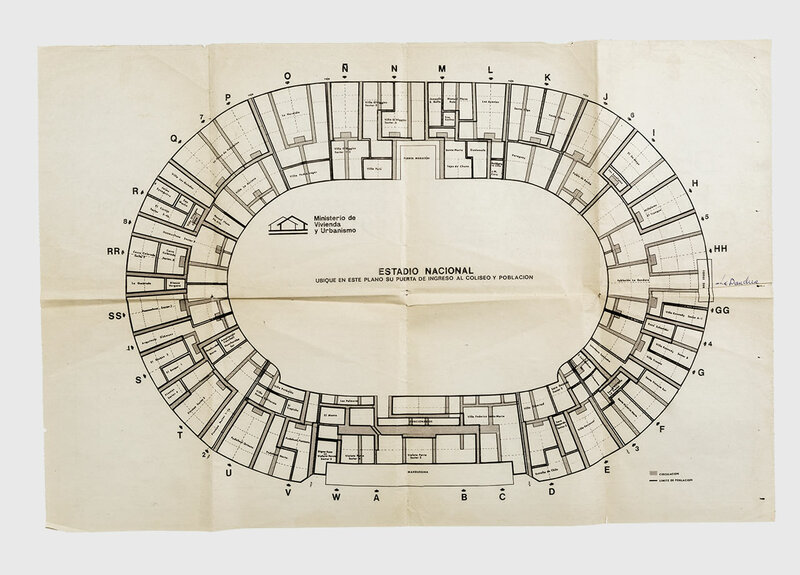 A blueprint of the stadium with the outline of shantytowns instead of bleachers was prepared, rendering the genesis of Santiago´s current layout within the drawing of a building. On the 29th of September 1979, the building was filled by 37,000 people for a massive operative which provided ownership titles to dwellers (pobladores). Weeks before the event the Ministry of Housing published a booklet in the official press along with a blueprint plan of the stadium. Sixty pages contained a long list of summoned people divided into the 17 communes of Greater Santiago , and in which more than 60 assorted slums were represented through various shantytowns and neighbourhoods. Each commune was then assigned a specific sector within the stadium (eg, 1, 2, 4-B, 1ª, etc), and a precise access door in the stand (eg, SS, RR, Q, J, HH, etc) which in effect created a complete grammar and aesthetic code connecting the building with the surrounding city. 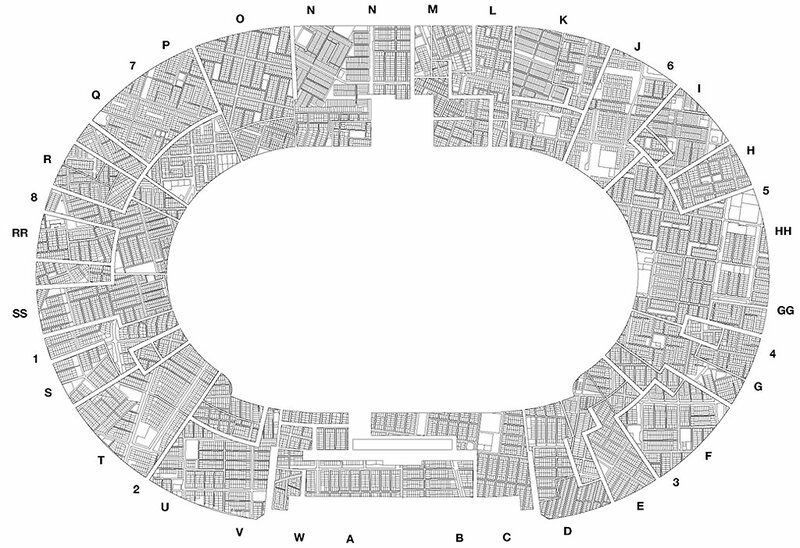 As a result, the published plan of the stadium no longer delineated seating blocks and individual stands, but visualised an ‘other’ city, marginalised from its centre and attesting to a number of different scales and places within a spatial and temporal panorama. The set of three plans that follow were found in the SERVIU Archive. These are the three original layers that overlaid made up the plan that circulated in the press. The first is a hand drawing of 104 x 150 centimeters of the Stadium galleries and bleachers in 1:200 scale. Drawn in black ink on tracing paper, it abstracts the building to its minimal expression: a sort of degree zero of the stadium typology. From simple flat tracks near hills for spectators to have views to elongated U-shapes with seating on three sides in the ancient stadiums, from central circular amphitheatres with surrounding seating to D-shape circus, from rectangular stages to the dominant oval shape, the typology has increased in complexity while persisting as a machine for viewing. In Mary Beard's words, "the amphitheatre subsists as an enclosure designed to give a maximum number of onlookers the closest possible view of a kill." The second layer reduces the Stadium to scaffolding: outline, structure, and entrances operate as a tabula rasa for the administration of the city. The plan becomes the site for abstraction, where the essential form of an idea ought to emerge: the place for planning the housing operative through an act of editing a building plan, of writing and re-writing in layers of tracing paper. 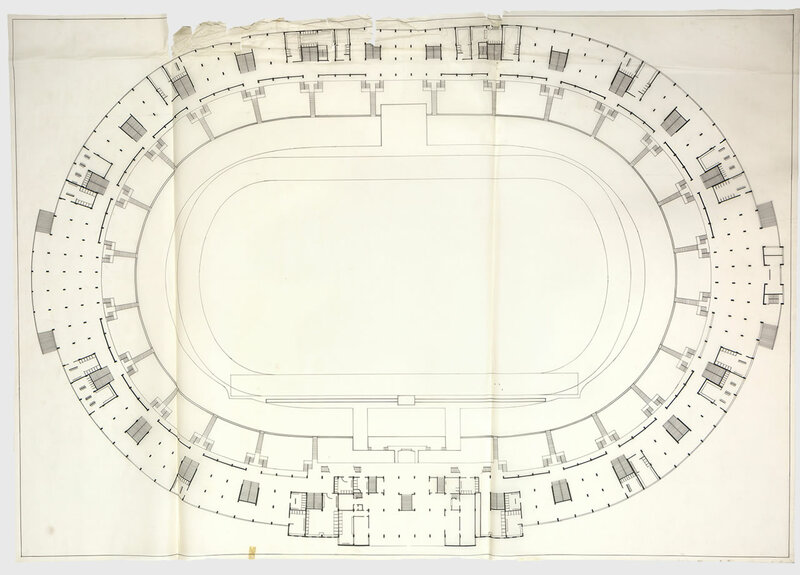 More than a reference to a finalised form, the diagram dictates the constraint for the combinatorial rules to take place in the abstract and generic space of the stadium typology. 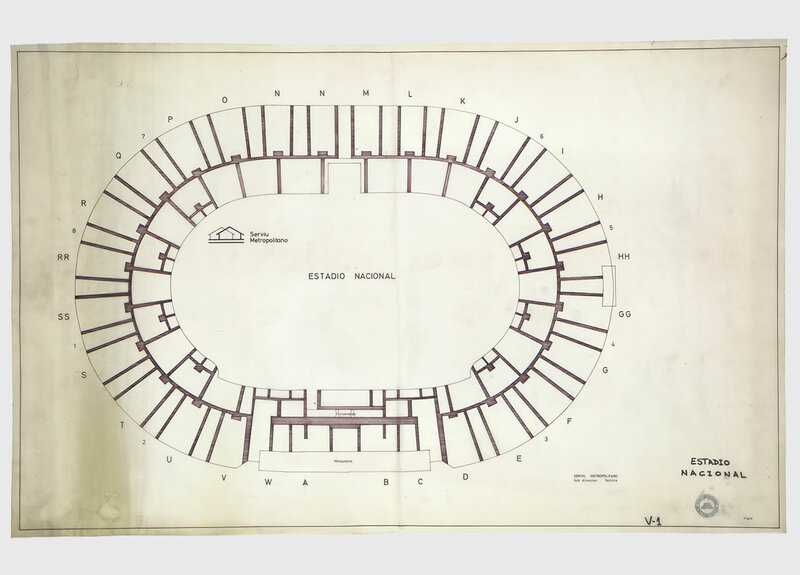 This hand-drawn plan of the Stadium laid "the scaffold for the spectacle," but could almost be the plan of any stadium at 1:200 scale. Abstracted from its external reality, the Stadium is deprived of its autonomous particular existence and therefore begins operating only in relation to a collective idea of what a stadium is. The diagram drawn in black ink on 104 x 150 centimeters of tracing paper becomes—after receiving the stamp of the institution—the approved regulatory game board to organise views and viewers. Divisions, partitions, enclosures of various size, distributions and entrances are the elements for the art of composition undertaken in the plan. Black ink on 64.5 x 102 centimeters tracing paper with no scale account: a diagram rather than a plan. Represented ona flat surface, composition becomes an art of systematic and diagrammatic combination to fit a city into a building, to transport the condemned-summoned bodies from the periphery into the centre. The resemblance of this drawing with the penitentiary diagram of perfect surveillance exposes the building as a control dispositive, an "abstract machine" to be occupied by an observer (in the Stadium's specific history, a role taken on by figures of power from Pinochet to the Pope), who takes the body as object and target of power, controlled within a building and administered by a city. The plan's synthetic potential becomes an ekphrastic description that is not simply a direct transference from a diagram of administration to the plan of a building, but a translation from one discourse to another, from drawing to building, from conceptualisation to materialisation, from words to objects, from the discourse on architecture to that on the city. 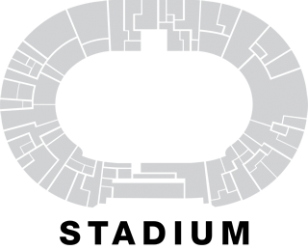 Circulating in the official press the days before the event, this plan is constructed by a superposition of the three former ones. Each partition corresponds to a neighbourhood with a precise access door in the stand identified by a letter or number: the spatialisation of the names and places described in the sixty-page booklet where the plan was inserted. A synoptic view of 37,000 people, of 60 peripheral shantytowns, of three hours of paperwork signing is deployed. People, documents, neighbourhoods, communes are indexed in numbers and letters into a grammar and aesthetic code connecting the building with the city, the Coliseo with the Población. In addition to the entrances, the legend of the plate shows only two categories: población and circulation, preventing the effects of imprecise distribution, uncontrolled movement, or diffuse circulation, tactics for eliminating desertion, wandering, or concentration.